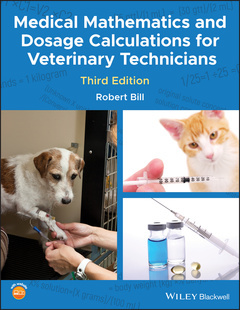 This user-friendly guide to medical mathematics helps veterinary technician students develop the math skills required before going into the practice setting. 2.4 Comparing Decimals – Which Number Is Larger? 6.9 Estimating the Answer: Does Your Answer Make Sense? Robert Bill is a Professor Emeritus of Veterinary Pharmacology and former Program Director of the Veterinary Technology Program in the College of Veterinary Medicine at Purdue University in West Lafayette, Indiana, USA.